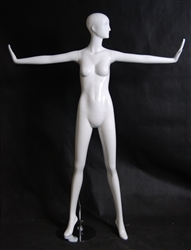 Our black gloss abstract female mannequin is super chic and stylish. Posed with her arms by her sides and her left leg pointed outwards. • Chest 36" Waist 26" Hip 33"
• Brushed Chrome Base 14½"